20 Free Crochet Cup Cozy Patterns Perfect For A Quick And Easy DIY Christmas Gift! This vest crochet pattern cannot be simpler and yet so beautiful! 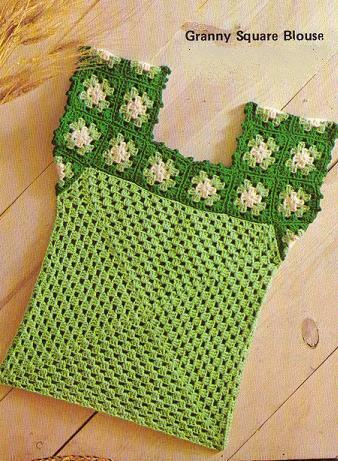 This lovely Summers End vest designed by Helen Shrimpton is a very pretty waistcoat build up with little squares. Follow the pattern as it is or be creative and use your favorite square pattern to male your own stunning end of Summer’s- beginning of Fall vest. The pattern is free until 15th October 2018.
and you have two different sizes to choose from. If you want to make your vest a bit longer add one or more rows with squares at the bottom. As Summer draws to an end in the Northern parts of the world, and we start to have slightly chilly mornings or evenings, this waistcoat is the perfect accessory to go with jeans, long sleeved T’s and boots. Made as motifs, with a simple join as you go. The pattern includes different layouts for longer or shorter waistcoat and also instructions to change size. …I used the Summer Pudding yarn pack. A total of 5 100g balls of Bambino and Bellissima yarns, with a 4mm hook. There are 2 colours from the Bambino range, Heather and Sage, and 3 colours from the new Bellissima range Double Denim, Purple Passion, and Single Cream. I have designed this edge to edge waistcoat for a medium or large size. But you can go smaller or larger, and the pattern tells you how. Mine is large, and fits a UK size 16 to 20, the medium size will fit a UK size 10 to 14. Get the Pattern —>Summers End Vest Crochet Pattern. Thanks to Helen Shrimpton for the article inspiration and featured image.